If you spend any length of time in an RV, then you know how important cupboard space is. Every bit of space matters in an RV. Unfortunately, RV cupboards can be hard to organize because the space tends to be odd, and is different in every rig. One cupboard may be tall but not deep, and another deep but not wide. Often, the hardest part is reaching the stuff in the back! 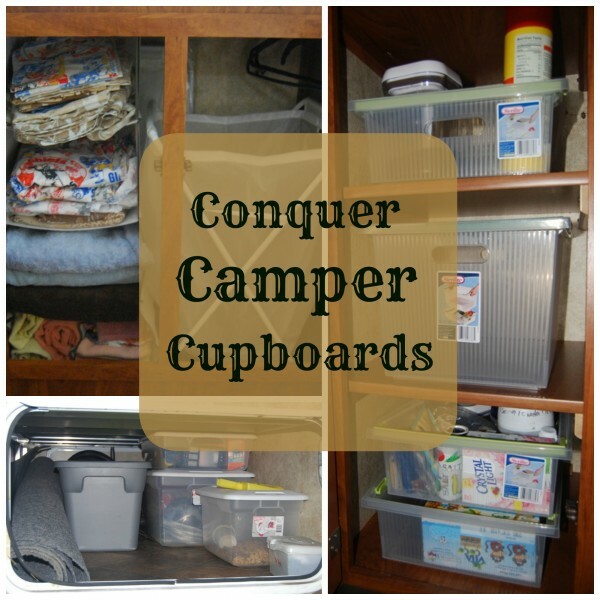 For some great creative methods on how to organize RV cupboards, we turn to the experts at The Touring Camper.com Here are five of their tried and true suggestions. 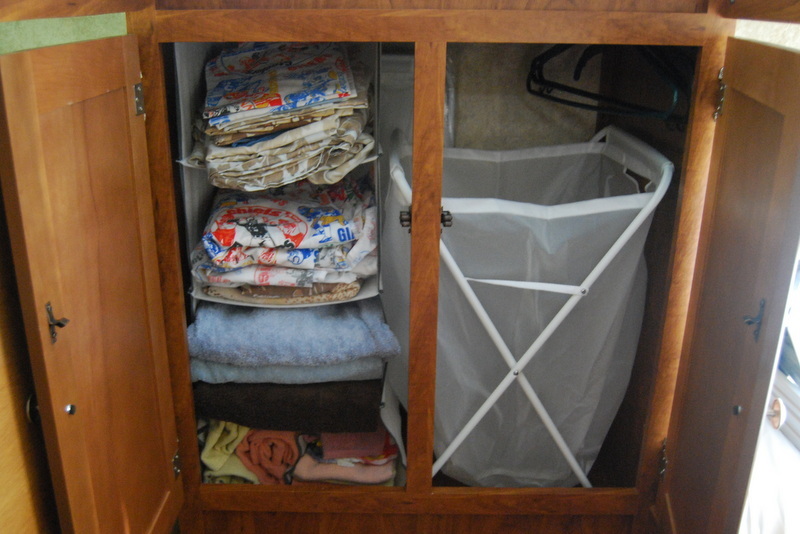 If you have a wardrobe cupboard in your RV, you may be wasting the space. Initially, Kristin and Jarret (aka the Touring Campers) piled their blankets and linens in the wardrobe creating a mess and wasting a ton of space. Eventually they decided to hang a cloth closet organizer form the bar at the top of the wardrobe. PERFECT! The closet organizer allowed them to organize the towels and spare linens while leaving plenty of extra space. Be sure to use the organizers with the Velcro strip tops. The wire hook kind will not last while you are traveling. 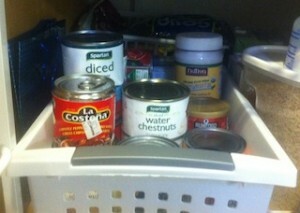 If the organizer is too long for the cupboard you may want to cut off the excess at the bottom. Fill up the spaces with whatever linens you have available. You will be amazed at the space savings. RV cupboard space can be used in a variety of ways. You just have to be creative! Finding a space for the laundry hamper can be a problem for every RVer. There just doesn’t seem to be a spot to store dirty clothes. With this in mind, The Touring Camper decided to use the left over space in their wardrobe cupboard for a full size hamper. 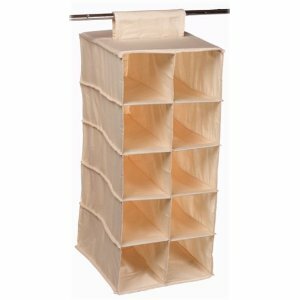 There are many types of self standing laundry hampers. Measure your space accordingly before you go shopping. The RV pantry is one of the most used areas in the camper. The best solution is stackable plastic bins to keep your food from rolling around. Choose ones with handles so that you can slide the box out, reach in for your item, and roll it back without breaking a sweat. This is the perfect way to store your canned goods without hassle. RV cupboard space can be challenging when food is rolling from one side to the other. Think ahead and you’ll travel with ease. 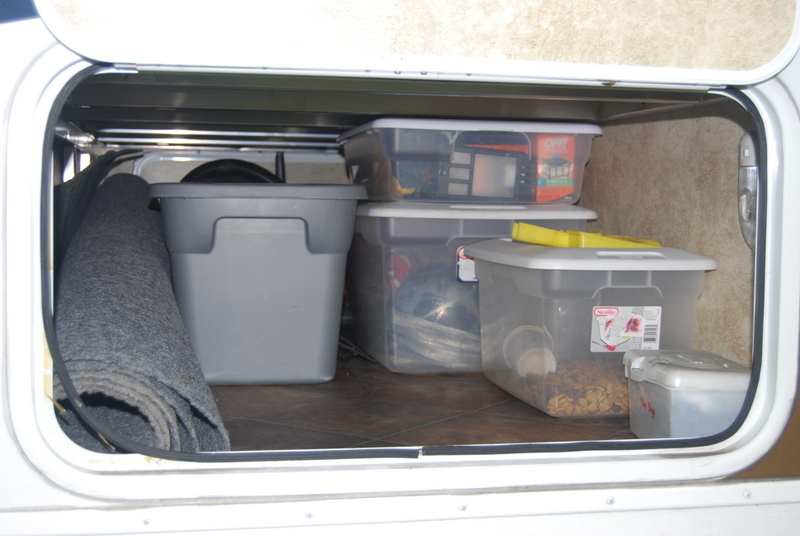 Depending on your unit, the compartments underneath your camper may be large. The good news? You can bring a lot with you! The bad news? How are you going to reach it? 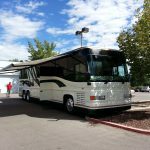 As your RV moves, things stored in your basement will slide, tumble and roll. Avoid creating a hot mess by using a variety of large storage bins and/or storage drawers. This will take some thought. What items do you use all the time? What items do you need on hand just in case? Items you plan to use must always be stored in front for easy access. Do you have an outdoor carpet but no place to store it? Why not store it on a tube within the back camper bumper. If you have a hollow bumper remove one of the caps and take a peek. You may find you have far more storage than you expected. 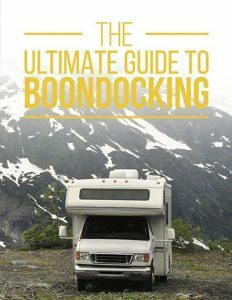 Be sure to visit the Touring Camper’s Pinterest page for more great RV storage ideas. Do you have storage secrets? Share them here so others can benefit from your great ideas. Add your thoughts in the comment box below. When you are done, please share this article with your friends. Tweet it, Pin it, Post it. We appreciate it!